Website Traffic - Internet Marketing that Works! As I talk to various business owners about setting up listings for them in Google’s Local Business Center, I frequently discover that they really don’t understand the ways a visitor can arrive at their website. 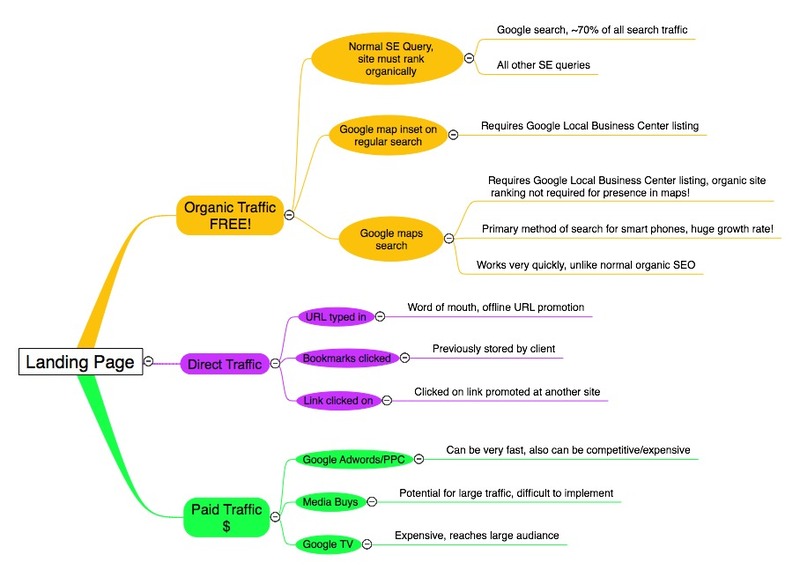 Looking at the graphic below you will see three distinct paths, organic, direct, and paid traffic. The top branch is the best because after you do some initial setup and search engine optimization (SEO), the traffic is free and plentiful, provided you did things right to begin with. It involves all traffic that “finds you” due to ranking for particular keywords or keyword phrases in the various search engines. They can only find you if your web page ranks in Google or in Local Business Center for the keywords that the customer is searching for. Depending on the traffic associated with given keyword, a number one or two ranking in Google can bring huge quantities of traffic to your site. Direct traffic can be anything from someone clicking on a saved bookmark in their browser, to clicking on a link at another website that links to your site. If the external link is on a high traffic site, you can get lots of vists, but in general this is a medium level of traffic at best for most business owners. The last category, paid traffic, has several advantages and disadvanages. On the plus side, the traffic can be enormous and almost instant. It is also very relevant and targeted traffic when done correctly. Some of the challanges involve managing the ad campaigns and dealing with Google. Google can be very fickle. A campagn that was working fine and generating sales on Monday could be hit by a change in policy at Google and be brought to a standstill on Tuesday. Unfortuantely, unless you spend large sums of money with Google, there is little help available when things go wrong. Hopefully this helps you understand where your visitors come from. We are always here to answer questions for you so drop us an email if you want to know more.